Huawei's Matebook 13 notebook may be positioned as a step down from the Matebook X Pro, but it offers much more under the hood and for a cheaper price, too. Should you buy the Huawei Matebook 13? Huawei’s Matebook 13 is an even more powerful notebook than the premium Matebook X Pro we reviewed last year—and it’s priced more cheaply than its sibling, too. Average battery life and a lack of Thunderbolt ports are the only blemishes on this well-made and well-priced 13-inch laptop...assuming you don’t mind the whiff of security concerns. 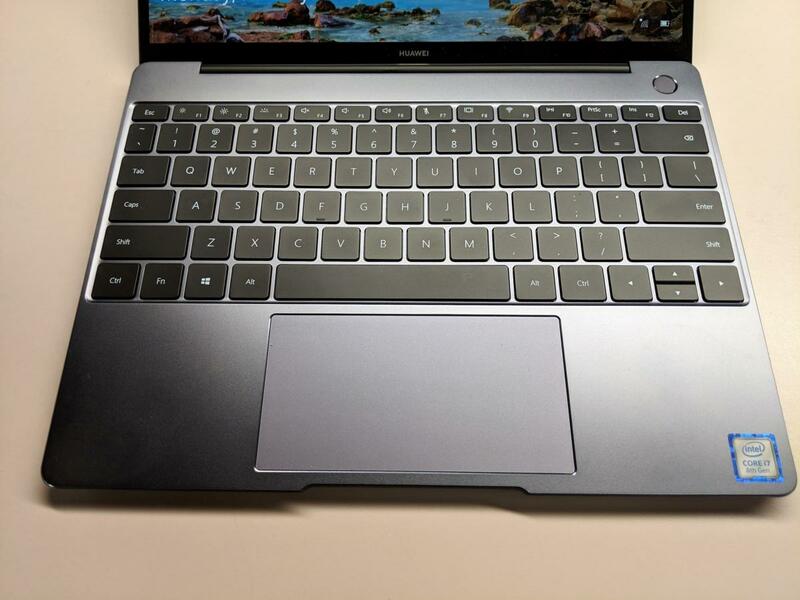 Our review unit, received just weeks after Huawei introduced the Matebook 13 at CES, is the premium configuration. It's also the first laptop we've reviewed with Intel's new Whiskey Lake Intel Core i7 processor. Whiskey Lake is yet another CPU based on the company's aging 14nm manufacturing process; however, Intel is promising better connectivity as well as a decent speed bump of about 10 percent over the prior generation. Add to that the Nvidia GeForce MX150 GPU, and the $1299 Matebook 13 looks like a good deal compared to the $1,499 for the Matebook X Pro. Read on for more about the specs, features, design, and performance. The Matebook 13 squeezes a 13-inch display and current Intel Whiskey Lake processor, plus a GeForce MX150 GPU, into a compact profile. 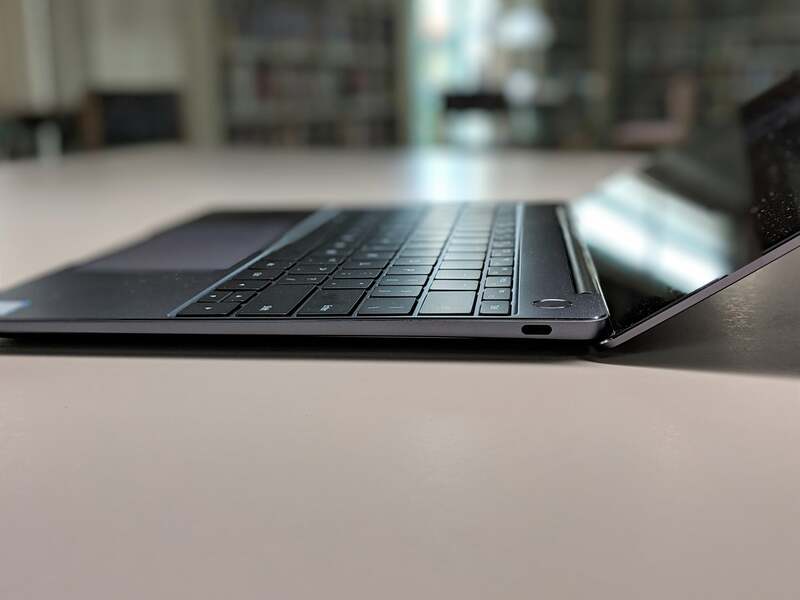 As we noted in our hands-on, Huawei and its rivals are working hard to shrink laptops. The Matebook 13 has a screen-to-body ratio of 88 percent, with very slender bezels. Meanwhile, the spacious keyboard spans nearly the entire 11.26-inch width of the chassis. The result of the densely packed design can be felt when you pick up the Matebook 13. 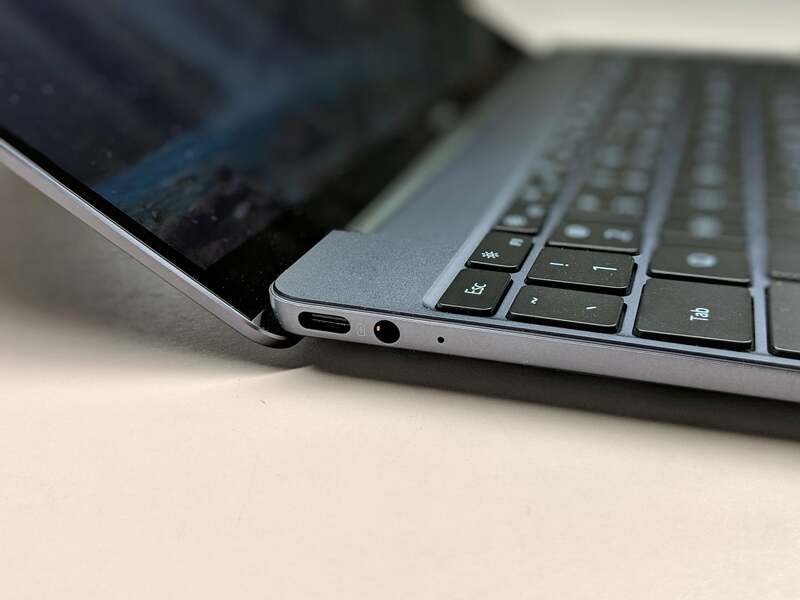 At almost 3 pounds and 0.59-inch thick, the Matebook 13 is surprisingly dense and moderately thin, though it does seem particularly stable. There’s no discernible keyboard flex. When I wiggled the base, I was able to force just a slight wobble in the display portion of the laptop. It reclines to about 35 to 40 degrees off the horizontal—a bit further back than some, and very comfortable for taller users. The Matebook 13’s embedded fingerprint reader within the power button is one of our favorite conveniences within Huawei’s laptop. 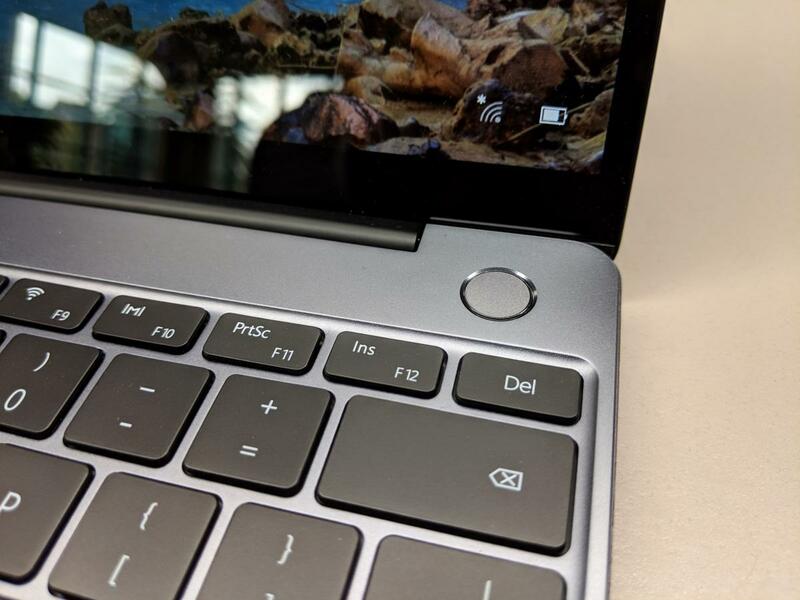 Huawei kept its fingerprint reader in its convenient location underneath the power button, where I’ve rarely had a problem with my finger being read, either on the Matebook 13 or its more powerful cousin, the Matebook X Pro. Huawei does an excellent job here. Otherwise, though, the ports are rather spartan. There are two USB-C ports, one on either side of the Matebook 13, and that’s all. Unfortunately, neither are Thunderbolt-powered, and only the left-hand port can accept power. (A small pop-up in Mandarin advised me of this—I think—when I tried plugging in my review unit incorrectly.) No SD card slot, no SIM slot, though there is a headphone jack. It’s worth noting that Huawei ships its MateDock 2.0 in the Matebook 13 box, which includes a USB-A port on one side, and VGA, and HDMI (plus USB-C power) on the other side. Huawei bundles the MateDock 2.0 with the Matebook 13, providing HDMI, VGA, and USB-A (on the other side of the device). Huawei rates the Matebook 13’s screen at 100 percent of the sRGB color gamut, with a contrast ratio of 1,000:1. While we didn’t check the color fidelity, our light meter reported that the 2160x1440 display puts out a comfortable 323 nits of luminance. We consider about 260 nits to be satisfactory for comfortable indoor use. 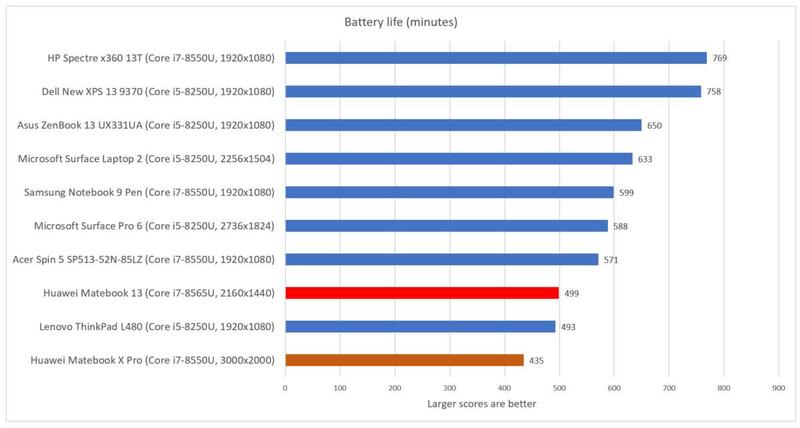 Note that choosing a 1440p panel as opposed to a 1080p panel does impact battery life. Huawei’s keyboards are among the best in the business: spacious, with a comfortable amount of key travel. There are two levels of backlighting. Some of you may prefer a stiffer keyboard that provides a greater amount of tactile feedback, like the Microsoft Surface Laptop series. Personally, my fingers have become used to gliding about a keyboard, with minimal pressure. Tastes vary, but rest assured your fingers should be comfortable. No real surprises within the Matebook keyboard, just a broad expanse of comfortable keys. Huawei builds in support for its PC Manager utility on the row of function keys, with a dedicated key in the upper row. The included trackpad is large. Notably, it’s clickable over the vast majority of its surface. My only nitpick is that it didn’t always register three-finger swipes to flip between apps. Huawei doesn’t offer many expansion ports on the Matebook 13, here shown at full recline. As you might expect, the audio quality of the Matebook 13’s speakers is average, though the built-in Dolby Atmos enhancement technology improves it noticeably. (Our review unit came with the Dolby technology switched on automatically, which Windows now carves out into the separate Dolby app versus its traditional home in the Windows 10 audio settings.) With the enhancement turned on, the Matebook hits some acceptable lows, though the midrange and high notes still sound much better. The sound volume out of the Matebook’s speakers is more than acceptable. This USB-C port allows you to charge the laptop, while the other does not. 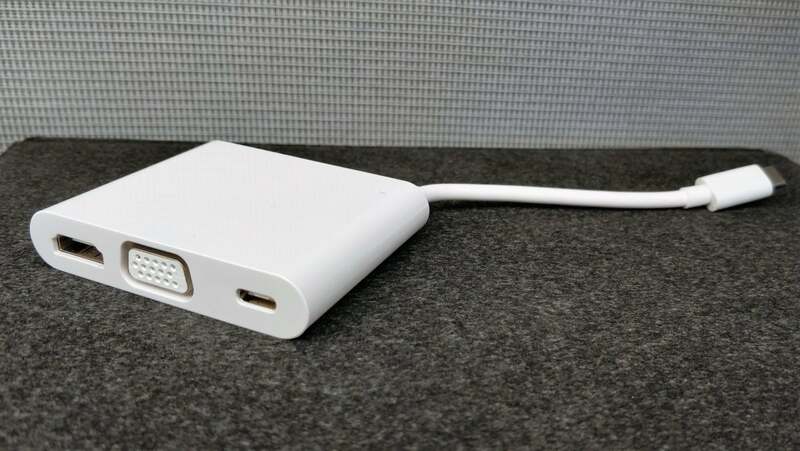 Neither of the Matebook 13’s USB-C ports include Thunderbolt I/O. Huawei exercises restaint with extraneous apps, though it’s hard to say where Huawei’s contributions end and Microsoft’s begin. There’s a Fitbit Coach app and Cooking Fever, both of which I haven’t seen before, as well as the usual contingent of Candy Crush crapware that appears on new Windows machines. Huawei’s own PC Manager software is pretty bare-bones, offering three main functions: the ability to upgrade the hardware drivers, check the various hardware devices for problems, and provide a link to the owner’s manual. Huawei also includes a one-year subscription to Microsoft Office 365 Personal, a $69.99 value. Unfortunately, it’s not enough to consider the usual factors when deciding whether to buy the Huawei Matebook 13. It’s impossible to ignore reported efforts by the U.S. government to pressure other countries to block Huawei telecommunications equipment because of security concerns. 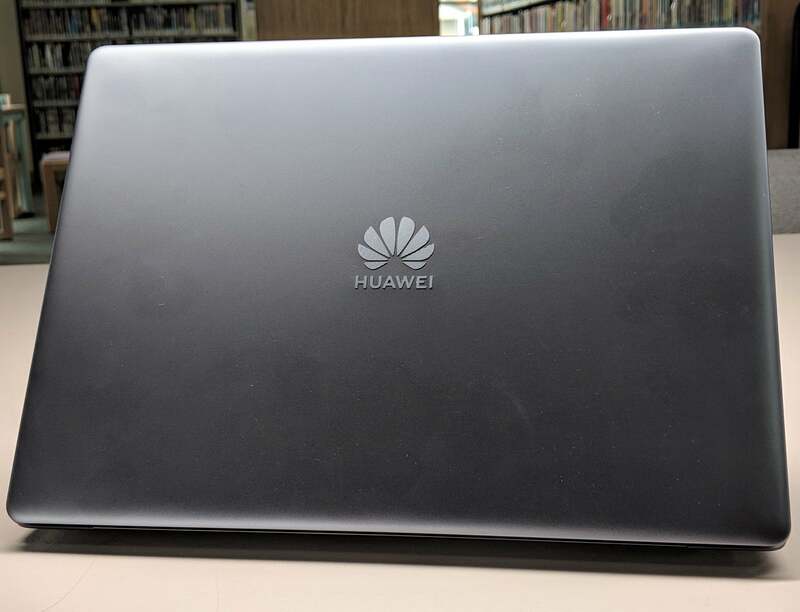 On Monday, the Department of Justice alleged that Huawei Devices USA—the company responsible for the Matebook 13—tried to steal information about a T-Mobile testing robot as part of a broader indictment against the company and its chief financial officer. That case has yet to be tried, and Huawei has also denied the charges. “Huawei executives insist that they are independent of Beijing and would never compromise customer data, though U.S. officials point to Chinese laws requiring domestic companies to cooperate with government requests as evidence that the company poses a security threat,” the Post reported. As one of the early notebooks featuring an Intel Whiskey Lake Core chip inside of it, we were eager to get a look at how Intel’s most recent chip performed. There are now a few years' worth of Core chips that fall under the 8th-gen umbrella, though they’ve still incrementally improved performance and battery life with each iteration. Like some other notebooks we’ve recently tested, the bottom of the Matebook 13 heated quickly when the SSD was put under load, and not the CPU. Though the Matebook 13 is not fanless, the “Shark Fin 2.0 system” cools the device by pulling air in with an 8,000rpm cooling fan and distributes it through the back of the notebook. It’s effective, and leaves the fan on for short periods before turning off. It’s also a substantial improvement over the earlier Matebook X Pro, whose fan turned on frequently. Otherwise, the Matebook 13 cools down quickly, and is never uncomfortably warm to rest on your lap. 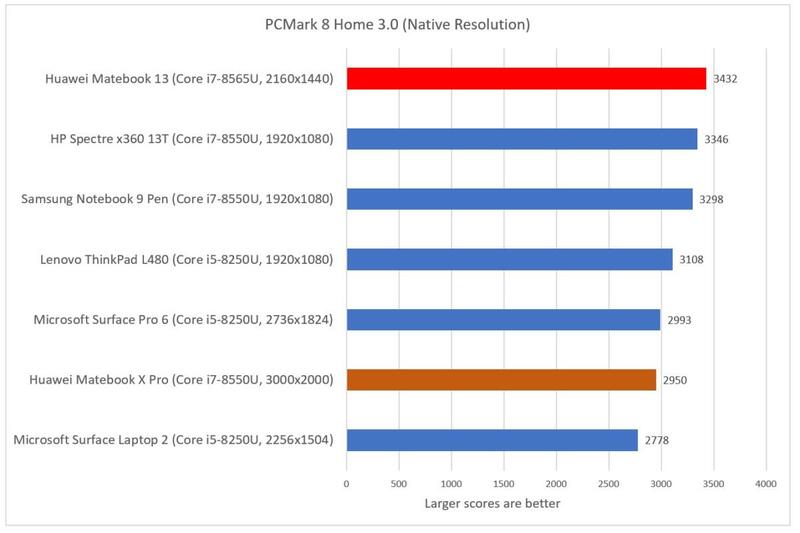 We’ve compared the Matebook 13 (red bar in charts) to a number of rivals, including last year’s Matebook X Pro (brown bar in charts). The Matebook 13's performance is noticeably better overall compared to the Matebook X Pro. Remember, though, that the Matebook X Pro’s screen is of a significantly higher resolution. We begin with the PCMark 8 battery of tests: Work, Home, and Creative. The Work suite of mainstream productivity applications (word processing, spreadsheet calculations, a simulated video call) is a cakewalk for any recent Intel Core CPU, including the one in the Matebook 13. None of the scores below is anything to be ashamed of, but the Matebook 13 leads the pack. The Matebook 13 gets off to a good start, soaring to the top of the heap. The Home and Creative tests emphasize the multimedia aspects of daily life a bit more. The Home test measures tasks associated with content consumption, such as web browsing, writing, gaming, photo editing, and video chat. The Creative test pushes a bit deeper into content creation, measuring performance in web browsing, photo editing, video editing, group video chat, media transcoding, and gaming workloads. The Matebook 13 once again tops all the others. Again, the Matebook 13’s new Whiskey Lake processor and discrete GPU propel it to the top of the class. 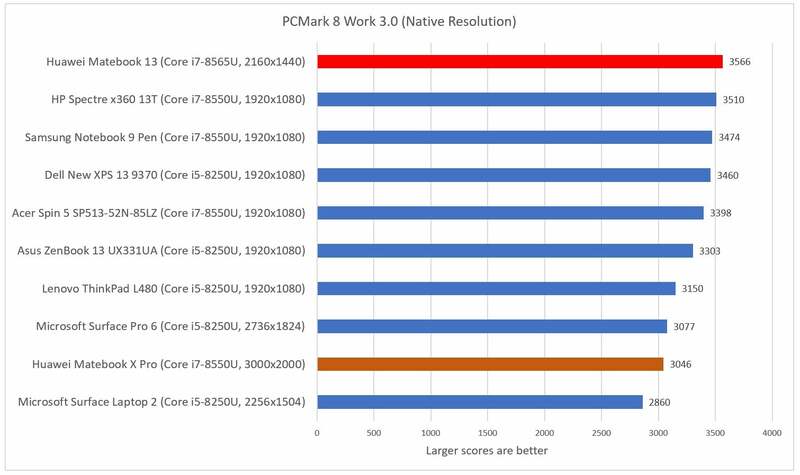 We don’t have a huge collection of scores for PCMark’s more modern PCMark 10 benchmark, but the Matebook 13 scored 4,299. In our tests, Dell’s New XPS 13 9370 was a close competitor—and the XPS scored 3,737, indicating the Matebook’s strong performance in office work. Maxon’s Cinebench benchmark is a staple of PC and component benchmarking, an offshoot of the company’s work in creating the Cinema 4D suite for computer animators. The most common test (and the one we use) applies all of the processor’s four cores and eight threads to rendering a static scene. Again, though the fan kicked in fairly early on, the scene rendered quickly, and the fan turned off shortly thereafter. Huawei’s Matebook 13 is the fastest of all of the notebooks we tested. These systems are somewhat tightly bunched, but there’s a measurable difference between the Matebook 13 and the rest. HandBrake, by contrast, is more of an endurance test. The open-source tool transcodes a full-length Hollywood movie into a format that’s appropriate for a tablet—a real-world test, even if one that might not be as common in an age where Netflix movies can be directly downloaded. Nevertheless, it’s representative of how well the PC will do on an application over time. With a time hovering around an hour, the Matebook 13 performs excellently. Only the Dell outperforms the Matebook 13 in the HandBrake transcoding test. Can the Matebook 13 serve as a gaming PC? 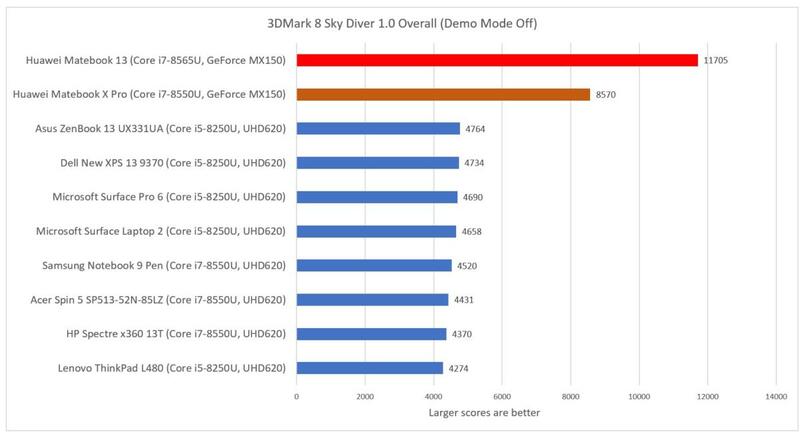 Not exactly, though the discrete Nvidia GeForce MX150 inside of it provides far more oomph than the average integrated chip, boosting it to the top of our 3DMark Sky Diver test. Phew! That’s what a fully-clocked GPU gets you. It’s kind of a tweener: You may have to dial down a setting or three (and probably eliminate most top-tier, modern games from consideration), but a fair number of games should be somewhat playable. It’s also telling how solidly the Matebook 13 blows the Matebook X Pro out of the water—and that’s because while the Matebook X Pro used a downclocked (937MHz) version of the MX150, the Matebook 13’s integrated MX150 runs at a base clock of 1,469MHz. The graphics performance increases considerably as a result. Finally, there’s battery life. Interestingly, Huawei told us at CES that the Matebook 13 would ship with a 41.8Wh batter, but our review unit shipped with a 56Wh battery—and, at full charge, it delivered 58Wh. That’s a substantial change, and perhaps a needed one, as the bigger battery barely made it past eight hours in our video rundown test. That's passable for a typical workday. The Matebook 13’s emphasis seems to be on performance rather than battery longevity. Battery life is a passable eight hours-plus with Huawei's Matebook 13. But a Whiskey Lake laptop with a discrete GPU for just $1,299? That’s a fairly compelling price point, and there’s a lot to like about the Huawei Matebook 13. 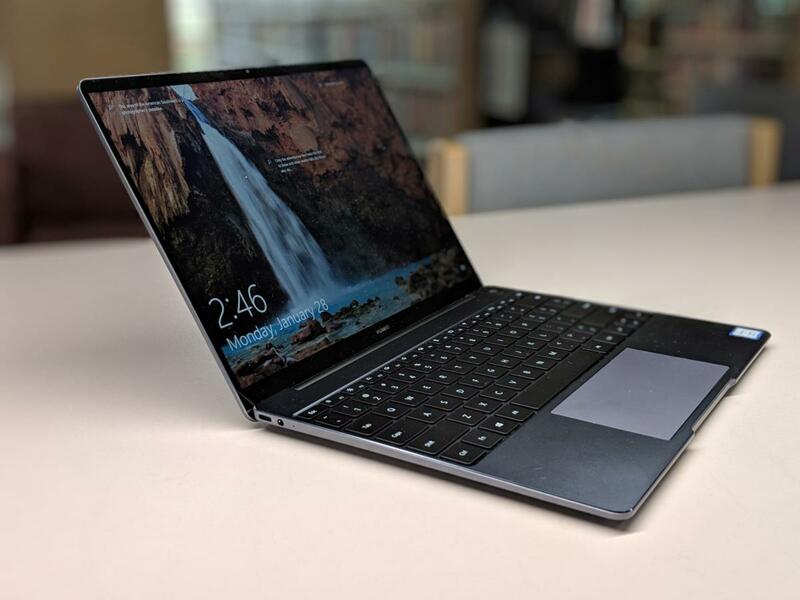 The Matebook doesn’t quite top the Dell XPS 13, however, which offers comparable performance, a slightly cheaper price point, and better battery life. 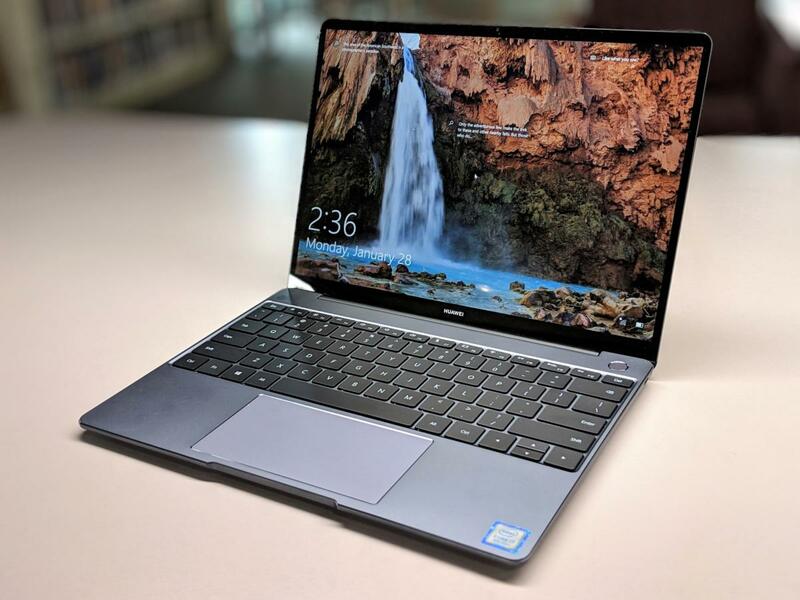 Huawei's 13-inch notebook integrates a full-powered discrete GPU plus Intel's Whiskey Lake processor into a well-made laptop that skimps a bit on battery life.